This is impressive stuff. I’m very curious to see how the “medical” diapers fare in these tests. I’m especially interested to see how the Tena Slips perform because high SAP ratios seen to fare well in the saline tests (and we all know how Tena Slips swell). Also I’d love to see what your thoughts are regarding the Seni Quatros. This is impressive, I have used this table to buy the diapers that are discreet yet would hold. And I heartily agree about the Thrust Vektors. They are the best diapers that I had worn. But I will try the others. Side sleepers require plastic pants to keep bed dry. Nearly all ABDL diapers available in the United States in size medium in January 2018 for ~$3.50/diaper or less were purchased to create a panel for testing under the new ADISC testing protocol. Diapers that differed in print but were otherwise the same diaper were treated as the same diaper for the purposes of generating capacity test data. For one diaper that was backordered (ABU Preschool), a stock on hand was used in testing. Price per diaper was determined based on the lowest price inclusive of shipping I could find on a given diaper at the end of January 2018. For most diapers, this means price was based on buying 1 case. For several diapers sold only in single packs, this means prices was based on buying 1 pack. For one diaper, DC Idyl 2017, this meant price was based on buying one quad-case. For comparisons which involve price, diapers which were grouped as one diaper for capacity because they differed only in print were further subdivided in the cases of Rearz and ABU products for which different prints have different price points. The results show that Thrust Vector Crinklz is clearly on a tier of its own in both tests. Most other diapers are closer to each other than they are to Crinklz, but a loose next tier would include Tykables Overnights, ABU LittlePawz/Space/Simple, Rearz Safari/Princess/Seduction/InspirePlus, and ABU BareBum. Noticeably, ABU BareBum improves significantly test and Thrust Vector Crinklz pulls further away from the pack on the saline test relative to the H2O test. While the overall correlation between the two tests is fairly strong, thinner "SAP-heavy" diapers seem to do better with the newer test. 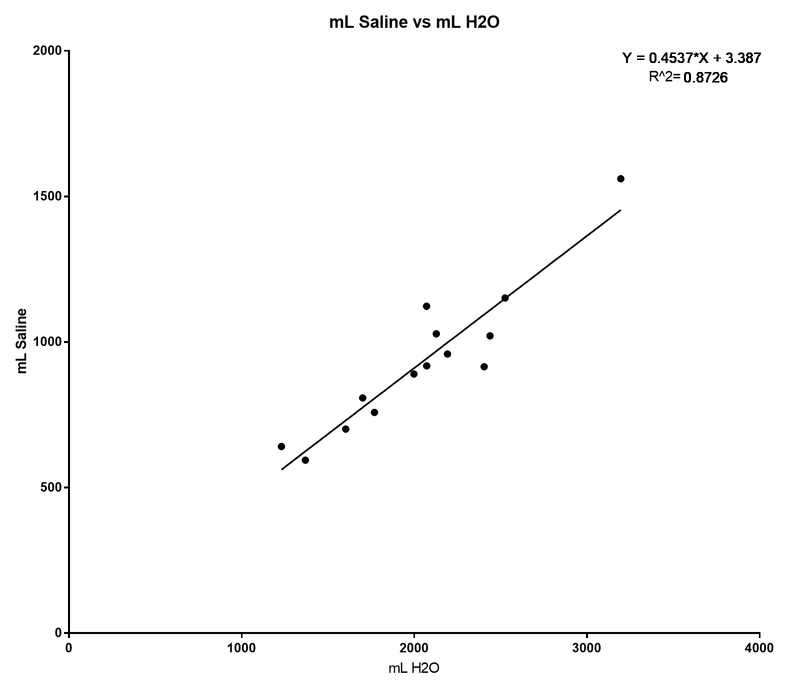 Along these lines, there is a weak but significant correlation between dry mass and H2O test result, but not between dry mass and saline test result, which is in line with the idea that SAP, which is lighter than wood pulp, helps a diaper overperform its H2O result. Being both a relatively cheap diaper as currently purchased through NorthShoreCare and the clear highest capacity diaper already, Thrust Vector Crinklz easily wins out as the best deal in ABDL diapers. 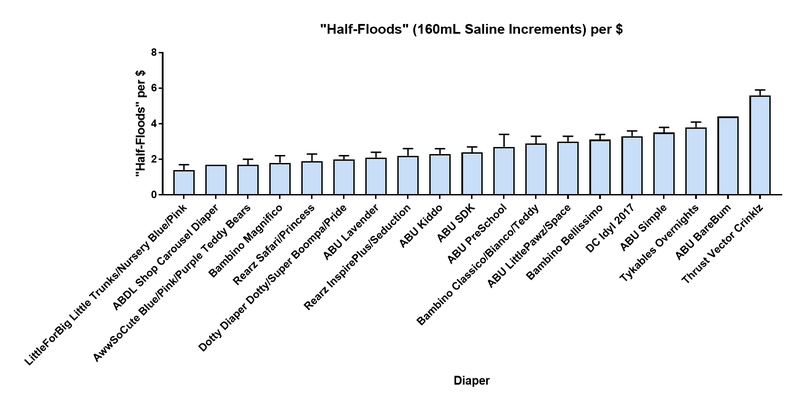 Other top cost-efficient diapers include ABU BareBum which performs on par with other top ABU products at a lower price point, Tykables Overnight which is an excellent all-around choice, and ABU Simple, which with no print is priced cheaper than ABU LittlePawz/Space. Broadly speaking, most diapers fall into a narrower capacity range than the difference in across the field in pricing. Nearly every diaper available for ~$2/diaper or less is in the top half. As of this writing in early 2018, there does not appear to be any correlation at all between price and capacity test result. There are several different factors at play which seem to lead to this result. First, newer manufacturers are in several cases selling diapers with mediocre testing results in only in single packs, which have a higher price per diaper. Second, the diaper that breaks the curve in capacity testing is also one of the cheapest. Third, even among more established manufacturers like ABU and Bambino, their best products are not their most expensive. Fourth, several manufacturers sell the same underlying diapers at different price points but with different prints. The net result is fairly dramatic, in that it appears that there's very little connection currently between price and performance. This strikes me as a very validating result for the project of testing diapers, as it demonstrates clear value in performing independent testing rather than relying on market signals to assess ABDL diapers. I did not expect such a impressive analysis. I skimmed through it and plan to read it carefully when I have a few minutes. I was gratified to see the Rearz Princess so highly rated. My sample should be here Friday. This is the type of analysis I would see during my MBA program. Impressive group of people here. Gotta love cold hard data! Excellent work by all involved. Thank you for all the great information. As an active, urinary incontinent adult, I have found it difficult to find the right combination for every situation. The information here really helps. The mainstream continence forums are focused on cures. Those of us who don't have that option need the focused help that this forum provides. I have been using Abena L4s and M4s along with Confidry Mediums and Depends Real Fit L/XL with Garywear PUL briefs over any of these products. All of them have their strengths and weakness. I have gradually moved to the L4's from M4's and am now trying the Better Dry Large and Confidry Large. What I have observed is that the slightly larger products give me a more comfortable fit, don't chafe as much and resist leaking better than the very snug fit M4's. The medium Confidry products are larger than the M4's but are still a slightly snug fit. I will post my non-scientific observations after using a few bags of the Better Dry and Large Confidry diapers. Thanks again for the support and information.